Lebensmittel in Mitte is a solid German restaurant serving the finest Southern German lunch in Berlin. Swing by for a lovely dining experience and a chance to eat an extraordinary meal. Southern German food cooked very well. That’s should be the motto of Lebensmittel in Mitte, and boy do they stick to it. You may wonder why I’ve waited so long to write about a place as famous as Lebensmittel. The thing is, I’ve been to Lebensmittel many times and the quality of my meals has ranged from fantastic to ok-ish. That’s the reason I’ve been hesitant to write about it on BFS. 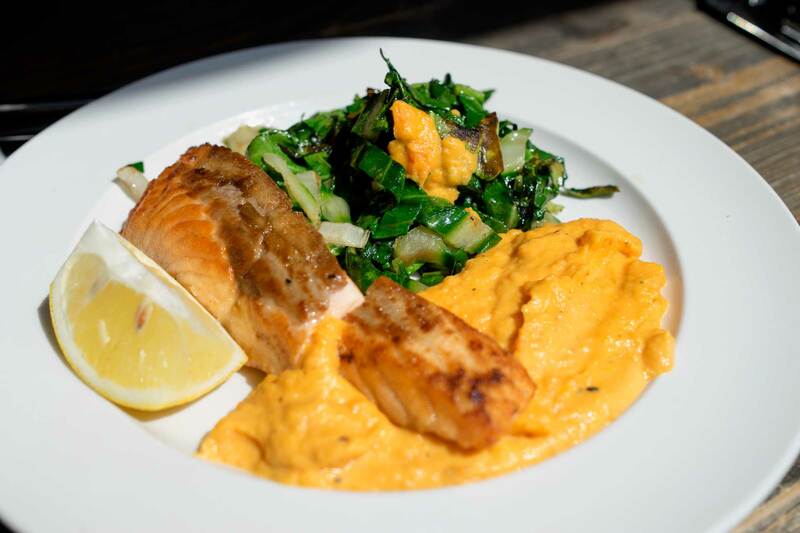 But then I hit this streak of great quality meals at Lebensmittel and so I decided I can no longer keep this place off the site and that it’s time to pick Lebensmittel in Mitte apart. 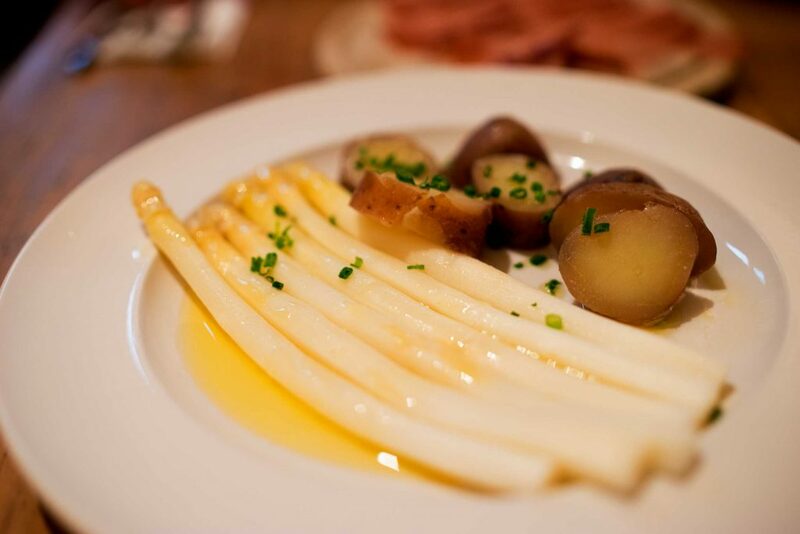 Why not a lunch Schnitzel with white asparagus drenched in clarified butter? It won’t keep you healthy, but it sure as hell will cure any bad mood you have that day! Usually German restaurants in Berlin are very rustique and the food is pretty sloppy and never really well executed. 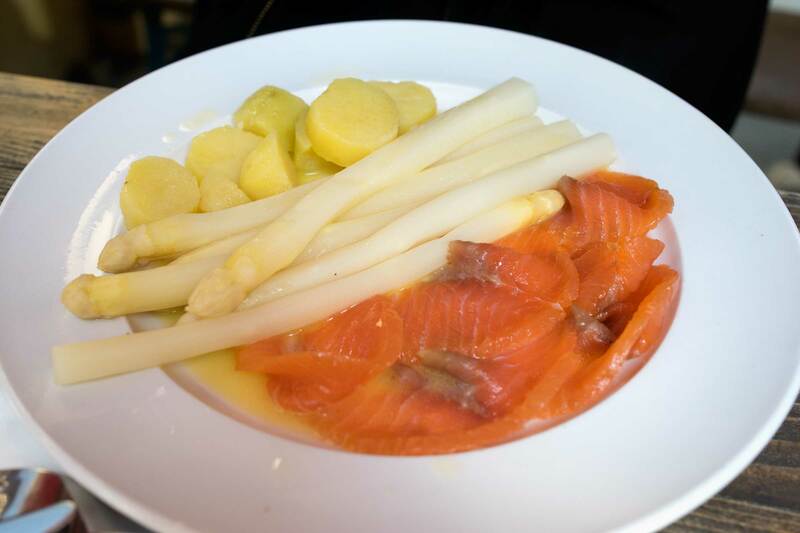 The seasonal ingredients are limited to the holy, white asparagus and in best case the chantarelle mushroom. You go to these places for fatty food and a couple of beers and they are not temples of sophistication. And that’s totally cool. 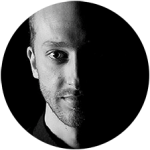 Lebensmittel is a bit different, it takes it just a notch further to another quality level where there is surprisingly little competition. Most of the food is very well cooked, a lot of the ingredients they use are home-made and the menu is very seasonal, which is quite unique. Lebensmittel in Mitte has not only the name but also the looks of an old school grocery store, they actually used to sell fresh veggies and fruit but nowadays the shopping experience is limited to some quality canned goods, wine and bread. 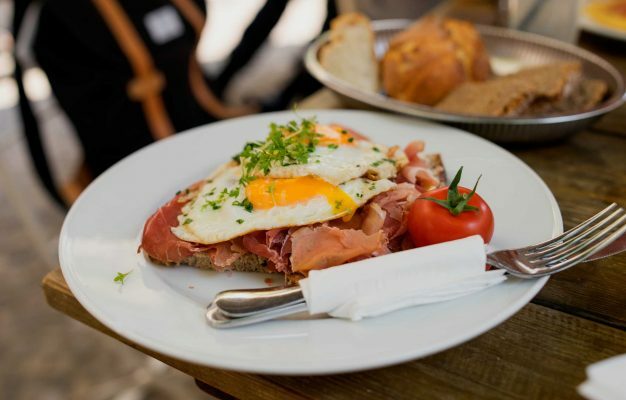 The venue is tucked away right behind the busy shopping street Alte Schönhauser but upon entering Lebensmittel you swap all that fancy Mitte flair for some proper wooden tables and a rustique, German vibe. Summer time you can sit outside on classic, German beer benches and enjoy the quiet side street. The venue doesn’t tell you much about the food but especially for lunch Lebensmittel has emerged as one of the prime locations in Mitte and I always enjoy coming back here. Oddly enough my lunches are almost always better than my dinners, but let’s get back to that later. 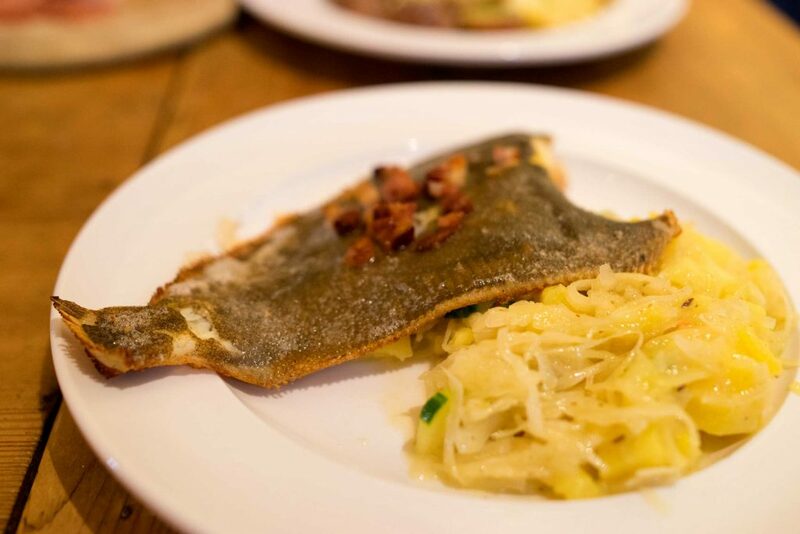 The food at Lebensmittel is straight Southern German and rustique but also highly seasonal and quite fresh. 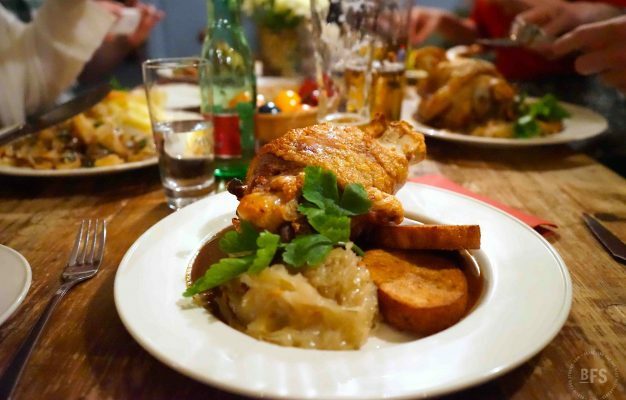 The standard menu is based around classics like Spätzle, Maultaschen, Schnitzel and Schweinebraten. These are all very good, especially the Spätzle and the Schnitzle hold very high quality. The Schweinebraten with the Knödel is not my favourite, but never the less tasty. The best food is usually on the daily menu though, which you can find on the chalk board above the counter. Here you will find all kinds of dishes, all depending on the season and the mood of the chef. And I’ve had some fabulous meals here, some of it I would even classify as the best bistro German food I’ve had in Berlin. Examples include a perfectly fried trout with spinach and potatoes. Delicious, and hard to get anywhere else. I’ve also had a divine blood sausage dish with fried potatoes, or why not a lunch Schnitzel with white asparagus drenched in clarified butter? It won’t keep you healthy, but it sure as hell will cure any bad mood you have that day. 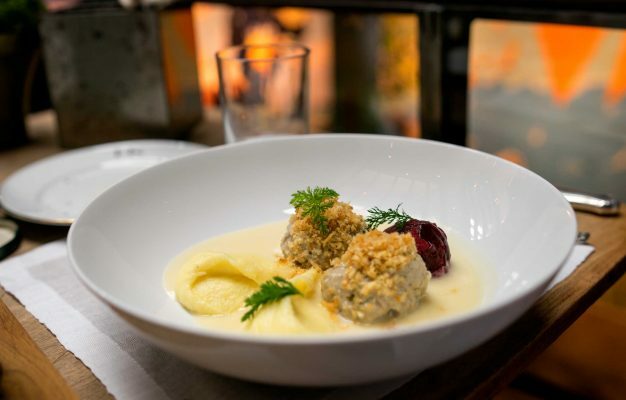 Lebensmittel stands out in the crowd of Southern German restaurants in Berlin. It’s one of the few places you really can get a seasonal, high quality and home-made meal. I would definitely more recommend to go here for lunch than for dinner, if you do that you will be sure to get one of the best lunches in Mitte. Especially for all of you visiting the city, looking for a proper lunch after your exhausting shopping spree on Alte Schönhauser. Don’t go to bloody Monsieur Vuong. Go to Lebensmittel.